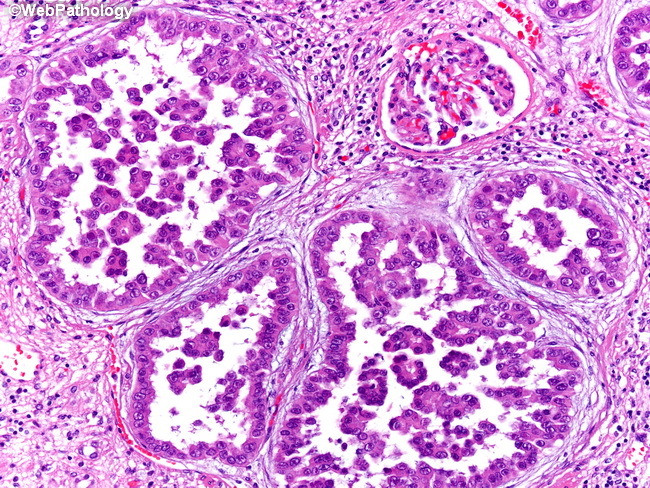 Type 2 papillary renal cell carcinoma composed of several tubulo-papillary strucures. The tumor cells are larger and have higher nuclear grade than that seen in type 1 tumors. There is nuclear enlargement and hyperchromasia, prominent nucleoli and more abundant eosinophilic cytoplasm. In contrast, type 1 tumors have small, hyperchromatic nuclei and scant cytoplasm imparting a more basoophilic appearance at low power. Type 2 tumors are considered to have worse prognosis than type 1 papillary renal cell carcinoma.